The Wooden Blue Spiral Viking Shield is a large Viking inspired circle shield with a classic spiral design. 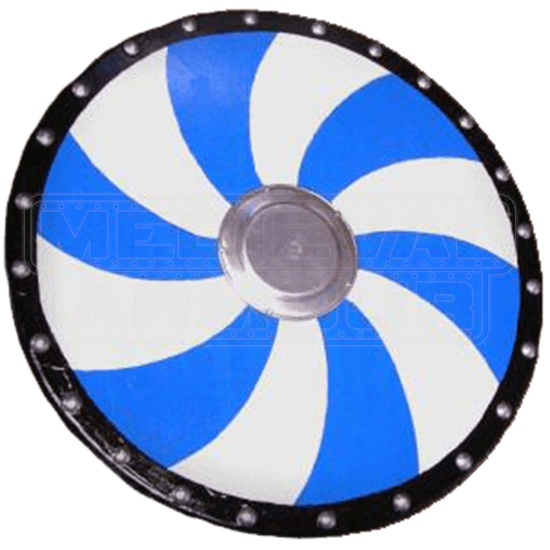 The Viking shield is made of a smooth composite wood which is considerably stronger than plywood. Stainless steel studs line the black border and a heavy aluminum disc has been bolted in the center. The Viking shield will hold up well against the rigors of moderate combat. The painted surface of the shield has also been applied with several coats of varnish to protect it from wear. On the Viking shields backside, dual leather straps are used to secure the arm. The wooden Viking shield measures about 25 inches in diameter more than enough to cover your arm up to the elbow. Whether for backyard brawling or for display purposes, this shield will suit your purposes wonderfully.